We get more carbonation in our Kombucha by pouring it into smaller glass containers with lids and letting it "sleep" in the refrigerator. We find that the longer it sleeps while refrigerated the better it tastes. We have allowed it to sleep for 30 days or more and we get a pleasant, increased carbonation. We do not let Scobies touch anything, especially metal. We keep them in glass containers only. We use clean hands or clean, wooden or glass utensils to move them around. We do not use soap to clean things as it may leave a residue. Instead we clean our hands with a mixture of raw vinegar and water and rinse them under very hot water before handling a Scoby. We do the same to clean bottles, utensils, etc. With long term use, the gallon glass jars get a Scoby "crud" and then we have to use a soap, rinsing the glass jars thoroughly. We keep everything at the same temperature when combining the tea and the Scoby. A Scoby is a living organism and we like to treat it so. We do not want to shock it with a drastic temperature change. When making a new brew, we pour off any of the old brew we left with the Scoby while it was stored. We use just the Scoby and a new batch of tea. We rinse the Scoby thoroughly in a large basin before re-using it in a new brew. It is, of course, better to use spring water or distilled water for rinsing, but the amount of water necessary to rinse the scobies can make these methods costly. We hereby admit that we have at times resorted to rinsing with tap water during large brews that involve enough scobies for brewing 12 gallons of Kombucha or more. We like to combine multiple Scobies in clusters with the white-side up to make a faster, richer brew. The Scobies seem to know the seasons. They brew faster in summer and more slowly in winter. In some older cultures Scobies have been dried out to a leather-like texture and used as alternatives for leather. We have never had a problem with Scobies spoiling. 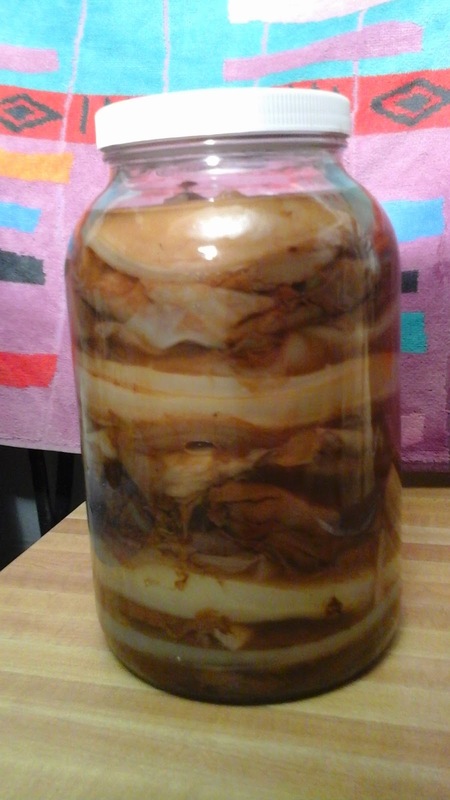 When working with a new, baby Scoby some people like to use less than a full gallon of tea in making the first couple of brews so as to not overpower the baby. When making a Scoby from scratch, the tea that is poured off is drinkable, but it will taste like vinegar. This is because of the 2-3 weeks that it takes to make a new Scoby using just brewed tea and a bottle of plain, raw Kombucha as the starter. Between brews we have combined as many Scobies as we can into the one-gallon glass brewing jars, along with some tea. We have stored them for 9 months in the refrigerator that way. No problem when we started brewing again, although we had to really rinse them. We've included both "purist" tips and also practical adaptations here. We also have read of people who make Kombucha without following any rules. We have read of someone who shredded their Scoby in a blender and it still produced. So there are a variety of ways to make and enjoy this drink. Post tips about Kombucha below.